A friend of mine, Hilda, has spent her life helping others, as she has been a hospice nurse, and now, an oncology nurse. I was saddened to hear that the neighborhood that she grew up in was hostile toward her family. She told me of a Christmas when she was six years old that her mother had gotten her a "Baby Secret Doll", that she longed for. As she came from a large family, she knew this was quite a treat for them to manage to buy it for her. She was so excited, and wanted to share the news with someone. She chose a girl, her age, which lived next door, even though she had not been very kind to her. 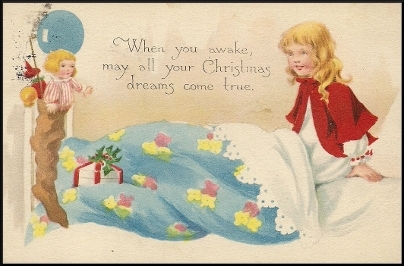 The girl took the doll, yanked the string, which made her tell the secrets, and broke it on that very Christmas Day. I knew that I could do nothing to repair the hurt that these people had caused the young child (long ago) but as I was interested in vintage dolls, and I began looking for a Baby Secret to see what she looked like? To my delight, I found one, whose body's stuffing needed replacing, and the white bib had turned to a yellowish/reddish color but her speaking mechanism was intact. She cleaned up very nicely, and I presented it to her on the week of Christmas, She was elated. She pulled the string and when it said, "Hi my name is Baby Secret", she said, that was that last thing my doll said, before the girl had broken her. The story leaked through our department, some patients were touched by her story, and wanted to see this "Baby Secret", which she proudly showed them. In Hilda's words, "Thank you for taking a sad, and crying 6-year-old, into a joyous child-like 50 year old". Dolls play a big part in a little girl's (and big girl's) life at the same time. I'm glad Hilda has her Baby Secret, although a little late in life, she knows that people are touched by her story, and want to show her love.